I’m always looking to review new grilling gadgets. 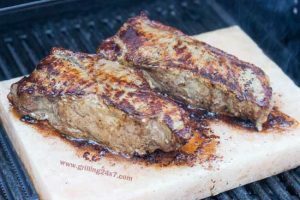 This one is a pretty cool wooden grill scraper that comes with a thin tapered edge on one side, allowing you to burn in your own grill grate pattern for a custom and highly functional grill grate scraper. The other side has a solid and comfortable handle. Most importantly this wooden grill scraper allows you to say goodbye to those cheap plastic scrapers with the metal bristles! 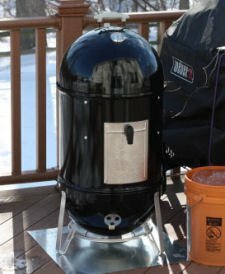 A few years ago I wrote a blog post about the dangers of metal grill scrapers and how there is the potential for the small metal pieces to get stuck in the grill grate and possibly become ingested if a piece of food comes in contact with it. The guys at Crazy Mazie appear to have a pretty cool solution to this problem. Crazy Mazie grill scrapers are wooden so there are no sharp metal pieces involved. I fired up the Big Green Egg and grilled some amazing T-bone steaks. I cleaned up the grates very nicely with the Crazy Mazie grill scraper. Check out this Crazy Mazie Grill Scraper Review. First of all, look at these T-bones! Gorgeous! When the wooden grill scrapers arrive they are perfectly flat on the tapered end. It’s summertime so why not show off that flat edge with a picture of the pool in the background? The flat tapered edge allows the scraper to be customized to your specific grill grate. I lit the Egg with a nice hot high heat and put the grate on. After a few minutes I pushed the Crazy Mazie grill scraper all around the grate. Immediately, and rather effortlessly, little indentations were formed that perfectly match my grill grate. After a few minutes of pushing the wooden grill scraper along the grates, these perfect little notches formed. This allows the scraper to grip the grill grate and clean the gunk off the sides of the grate too. My first thought was that these indentations would keep getting bigger and bigger creating some sort of fork looking contraption. That didn’t happen, however! As the wood thickens away from the tapered end it is much harder to form these little grooves. I confirmed this on the Crazy Mazie website where they say that the wooden scraper lasts for years as the thicker wood up top is stronger and once the grooves form near the end they do not keep getting bigger and bigger. Damn look at those T-bones. A rockin’ high heat on the Egg with a serious char. Those babies left some gunk on that grate. Tested out the clean up and it worked great! So far I’m impressed with this grill scraper. It’s high quality. No plastic is involved and most importantly no metal wire bristles. The scrapers have a nice little leather loop to help hang near a grill for easy storage. I think the coolest thing here is that the flat tip allows you to burn in your own specific grill grate pattern. 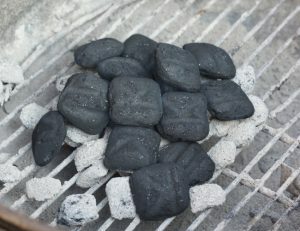 It will work on gas grills, smokers, charcoal grills of all sizes and grate patterns. Very cool. The grill scrapers are a little on the costly side, at $25 on Amazon (shipping included for prime members) but I think the quality is worth it. This is a nice product that works well. Disclaimer: I was sent a few scrapers to try out for free. Also, the Amazon affiliate link above will generate maybe 50 cents for me if you buy one through my site. However, if I didn’t think these were a cool product I wouldn’t be sharing this with you.